Muff Festival is running their annual Christmas Tree festival in Muff village this Sunday evening, December 2, from 5:30pm. 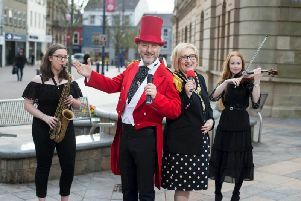 Organisers said that this is the festival’s annual” give back event” to the community and ensures an evening of festive entertainment totally free, with no cost to adults or kids. Events get under way at the Squealin’ Pig car park this year with a special visit with Mrs Claus who is encouraging any children to bring a Christmas picture or write a story. Local clergy will bless the crib before the elves open the grotto to all children so they can meet Santa, receive a small token and get their photo taken. A spokesperson said: “A local craft fair will run throughout the evening and we are excited this year to bring one of most popular Summer events into winter with a Christmas bake-off! Entertainment throughout the evening is from Muff Youth Choir, DJ Ois Bosh and Battle of the Bands winner Pear Natasha. Everyone attending the festivities will be kept warm with free mulled wine, mince pies and hot chocolate. Check out the full details on the Facebook page @mufffestival. or alternatively contact the organisers on 07387 257102.